For a better understanding, it is recommended that you open the earlier articles while reading this one. 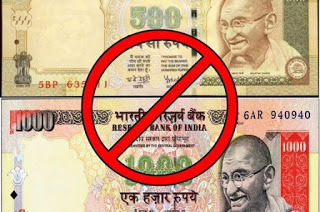 “Demonetization is the withdrawal of a particular form of currency from circulation.” Through demonetization the old currency is replaced by the new currency or a currency circulation is blocked. There are multiple reasons why a country demonetizes its currency, some reasons include to check the inflation, to curb the corruption and to promote the cashless transactions. Recently the Indian government decided to demonetize the biggest denomination notes i.e. 500-1000 Rupees notes, this step has been declared as a master stroke for the Indian economy by various experts. This is not the first time that India has demonetized its currency, earlier it was done in 1946 with the complete ban of Rs 1000 and Rs 10000 notes to deal with the unaccounted money i.e. black money. Second time it was done in 1978 by Government headed by Morarji Desai, when Rs 1000, Rs 5000 and Rs 10000 notes were demonetized. The main objective of this step is to unearth the black money, to curb corruption, counterfeit currency as well as terror financing. This step is considered as the biggest cleanliness drive against the black money in the history of Indian economy. As per RBI, 87% transactions in India are cash transactions and this loophole is used by corrupted people to build a parallel economy with unaccounted money. This parallel economy helps in terror financing which in turn hampers the growth and development of country. Currently high- values notes account for total value of 86% of the notes in circulation in India. It is expected that this step will help in reducing the fiscal deficit of India and promote the cashless economy in India which can be easily monitored. There are many cons of demonetization also, for instance, it creates panic among the common man. Local traders and shopkeepers are facing problem. It is expected that it will affect the SME sector in India. Demonetization step of central government will surely result into something good and help in reducing the black money. It will surely bring the clear view of every transaction within the country and promote cashless transactions. This step will affect general people to some extent but for the benefit of future generation such decisions are inevitable. We should welcome such brave step of Indian government which will curb black money to some extent. Hope this helps. Stay tuned for more samples.